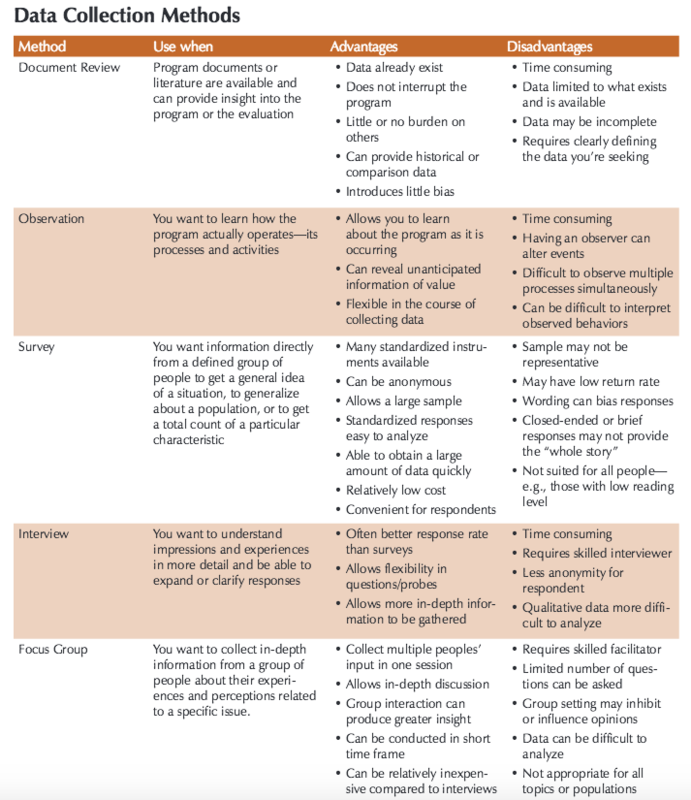 There are various typical (traditional) methods of data collection that can be used including: document review, observation, surveys, one-on-one interviews, and focus groups. The table below presents these options in more detail. For practical instructions, examples and templates for using these methods, refer to this data collection methods toolkit. Given its direct link to positive outcomes for mentees, one key dimension any mentoring program should evaluate is the quality of the mentoring relationship between the mentee and mentor. There are a number of existing tools to help service providers monitor and assess the quality of the mentoring relationship. Nakkula, M. J., & Harris, J. T. (2014). 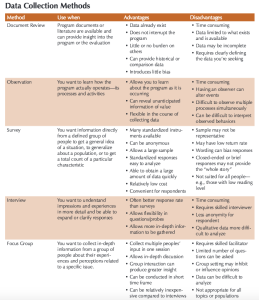 Assessing mentoring relationships. In D. L. DuBois & M. J. Karcher (Eds. ), Handbook of youth mentoring (2nd ed., pp. 45–62). Thousand Oaks, CA: Sage. Deutsch, N.L. & Spencer, R. (2009). Capturing the magic: Assessing the quality of youth mentoring relationships. New Directions for Youth Development, 121, 47-70. Kovach, M. (2005). Emerging from the margins: Indigenous methodologies. In L. Brown & S. Strega (Eds.) Research as resistance (pp. 19–36). Toronto, Canada: Canadian Scholars’ Press. Lavallee, L.F. (2009). Practical application of an indigenous research framework and two qualitative indigenous research methods: Sharing circles and symbol-based reflection. International Journal of Qualitative Methods, 8 (1), 21-40. McNiff, S. (1998). Art-based research. London: Jessica Kingsley. Tolman, D. & Brydon-Miller, M. (2001). From subjects to subjectivities: A handbook of interpretive and participatory method. New York, NY: New York University Press. Park, P. (1993). What is participatory research? : A theoretical and methodological perspective. In P. Park, M. Brydon-Miller, B. Hall & T. Jackson (Eds. ), Voices of change: Participatory research in the United States and Canada (pp. 1–20). Westport, CT: Bergin & Garvey. Wang, C., Yuan, Y. L., & Feng, M. L. (1996). Photovoice as a tool for participatory evaluation: The community’s view of process and impact. Journal of Contemporary Health, 4, 47–49.